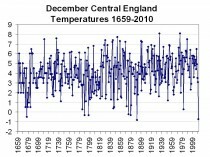 The Central England Temperature record is one of the longest continuous temperature record in the world extending back to the Little Ice age in 1659. December 2010 was the coldest December in 120 years with an average of -0.7C just short of the record of -0.8C recorded in December 1890 and the Second Coldest December Temperature in the entire record (352 years). Enlarged here. Note 2010 at the far right. In addition to the cold, heavy snow hampered travel by air, rail and road. In Ireland, this has been the coldest start to winter for the last 130 years, when general records began. According to Met Eireann, Ireland’s meteorological service, December has officially been the coldest month ever on record. County Mayo recorded low temperatures of -17.2C (1F). Ireland’s Armagh Observatory has a longer period of record extending back to 1795. The Armagh mean monthly temperature was -0.3 degrees Celsius (31.4 degrees Fahrenheit), about 5.4 Celsius below average, making December 2010 the second coldest December in Armagh. The three coldest Decembers in Armagh are now those of 1878, 2010 and 1796, with average temperatures of -0.5 C, -0.3 C and 0.6 C respectively. The maximum air temperature was 10.8 C on the 28th, whilst the lowest air temperature was -11.9 C on 21st, making the morning of the winter solstice the fourth coldest December night in Armagh since records of daily temperature maxima and minima began in August 1843. Previous cold December nights were -14.6 C on Christmas Day 1878, -13.7 C on Christmas Eve 1878, and -12.2 C on December 20th 1886. 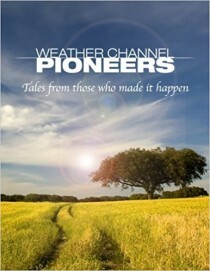 In 2010 there were twenty-four nights with grass frost and twenty-four with air frost, with snow falling on six days. The winter solstice, December 21st, was also the coldest day since 1843, with a maximum temperature of -8.0 C and an average temperature of -10.0 C. This was probably the coldest day in Armagh since the very cold 13th January 1814, which with morning and evening temperatures of -12.2 C and -13.3 C reportedly had ‘the hardest frost recorded here for the space of 20 years’. Germany has experienced the coldest December in more than 40 years, the German Weather Service (DWD) said. See report here. The average temperature in December was 4.3 degrees below the past records on average, the DWD said. People have never seen such a freezing December since 1969. The bitter cold was mainly stuck in the north and east of the country, where night temperatures in many places were below minus 20 degrees, the weather agency added. A DWD monitoring station near northeastern city of Postdam recorded only four days when the temperatures were above zero degree this month. Snowfall was very heavy. Munich, Germany, recorded a snowfall total for December of 52 inches and the temperature averaged 6.3C below normal. 42 inches of snow was reported in Berlin. For the first time since 1981, all people in every place of the country celebrated “a white Christmas” together in this December. In western Poland, the city of Poznan had a snowfall total of 58 inches. Poland temperatures were over 5C below normal. According to the Swedish meteorological agency SMHI, several parts of Sweden, including the southern region Gotaland and eastern Svealand, experienced “the coldest December in at least 110 years.” Temperatures were as much 8C (15F) below normal. 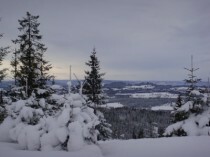 As Norway entered its fifth week of bitterly cold weather over most of the country, Norwegians were being warned that their electricity bills in January may be three times as high as they were this past January, when cold weather also had sent rates soaring. The ongoing cold snap has left mountain reservoirs with the lowest water levels in 28 years. That’s bad news for a country that relies on hydroelectric power. Spot prices for power have risen from 40 ore per kilowatt hour in the Oslo area earlier this fall to 72 ore this week, with more increases looming. The situation is worse for residents of central Norway, where rates are even higher. Days of continuous snowfall hit northwestern and eastern China, causing roadblocks and delays. Heavy snow fell in China’s northwest Xinjiang province after December 20 and accumulated to over one meter in some parts. The eastern province of Shandong has also been affected. Temperatures dropped to -25C in some areas, causing concern that China might see a repeat of the extreme weather of early 2008 that killed 129 people, left millions stranded and brought the country to a standstill during the Lunar New Year celebrations. Read more here. More than 100 people have died as a cold wave intensified its grip over northern and eastern parts of India, officials and news reports said Saturday. The northern state of Uttar Pradesh, which has been the worst hit, has seen 22 new deaths since Wednesday, taking the death toll from a fortnight of cold weather to 63, according to figures released by the state government. Most victims were either elderly or poor, with inadequate shelter and warm clothing, state officials said. The town of Churk was the coldest place in Uttar Pradesh on Saturday, recording a low temperature of 1.4 degrees Celsius. Meanwhile, more deaths were also blamed on freezing temperatures in the eastern state of Jharkhand, increasing the death toll there to 62, the IANS news agency reported. The capital New Delhi and the Himalayan states of Jammu and Kashmir and Himachal Pradesh have also experienced cold weather, leaving more than a dozen people dead there, according to local news channels. PDF here. Part II is the United States and Part III the Southern Hemisphere.